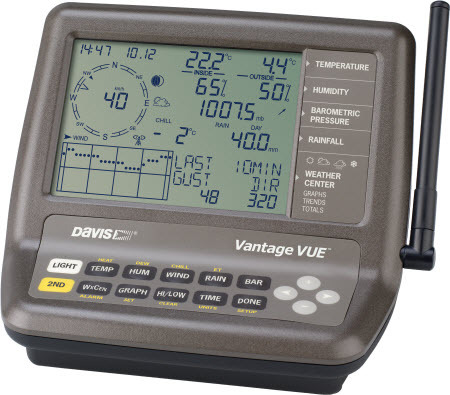 Our £349 Davis Vantage Vue weather station provides all the well-known Davis qualities of reliability and accuracy in a lower cost, compact and easy-to-use wireless-only package. Measures all six standard weather parameters, i.e. Visit shop. Tripod bundles also available. The Vantage Vue station consists of just two components: the display console shown here and a single all-in-one outside sensor assembly (referred to – by analogy with the VP2 systems – as the Vue ISS or Integrated Sensor Suite) – see picture below. Essentially all that’s required to install a Vue station is to attach the ISS to a suitable pole or mast by means of a single U-bolt and within wireless range of the display console, and to power up the system. Could it really be any simpler? All Vue stations that we supply come with our usual official 1-year warranty and our unrivalled after-sales support service. All of the outside sensors in the Vue ISS (ie wind speed/direction, temperature/humidity and rainfall) are located together in a single, compact, non-separable assembly, specifically designed for ease and simplicity of mounting and for minimising visual impact. This sealed, integrated construction with no external connections also allows the Vue ISS to offer maximum weather-proofing and corrosion resistance thereby making the Vue stations especially suitable for use at highly exposed sites. A passive radiation shield for the temperature sensor is fitted as standard. And the new ‘tipping spoon’ rain gauge is of course self-emptying. Sealed electronics in the ISS provide protection against the elements and thorough testing has confirmed that the ISS survives cyclic corrosion tests simulating wear in extreme weather environments. The Vue sensors are primarily powered from a solar panel built into the ISS design as standard and backed up by a small lithium battery, when necessary (typical battery life is about 18 months). It is worth underlining that the wireless technology used in the Vue is identical to that in the Vantage Pro 2 stations. Consequently, all of the wireless repeater options available for the VP2 to extend the range and penetration of the wireless signal are also fully compatible with the Vue. So the range from Vue ISS to console can readily be doubled with a single standard repeater, with the long range repeater option offering still greater range. For more information on wireless range etc with Vue/VP2 stations please see our advice pages. Note that the Vue system is not designed to receive data from any of the supplementary VP2 wireless transmitters, such as the Supplementary Temperature or Soil Moisture stations. (There is an exception in the case of the 6332 VP2 Anemometer Transmitter – more details on request). Because the Vue is wireless compatible with the VP2 wireless stations, one attractive option for users wanting an additional console on a VP2 system is to use a Vue console. Although its display is limited to the standard Vue weather parameters (along with solar and UV readings available in the Weather Centre area of the Vue display), this will not be a concern to many VP2 owners for use as a secondary display and especially bearing in mind that the Vue console is available for around half of the price of a standard VP2 console. Some comparisons between the Vantage Vue and VP2 stations have been included within the descriptions above. As a further aid, the table below provides more of a consolidated overview of the key differences between the two station types. * This is a comparison of our discounted special offer bundles for the weather station plus data logger. The stations are also available separately without data logger. ** Solar/UV sensors cannot be fitted to a Vue ISS. However, a Vue console can pick up solar/UV data from a VP2 Plus ISS. *** There is one exception in that a Vue console can receive wind data (only) from a second wireless transmitter, which could be either a 6332 Anemometer Transmitter (as used on a VP2 system) plus the 6410 VP2 anemometer or, alternatively, a second 6357 Vue ISS which is available as a separate item. These configurations allow the wind readings to be measured up high where they will register higher speeds while the other readings are made closer to ground level where they will also read more accurately. There is obviously a significant extra cost to this option.